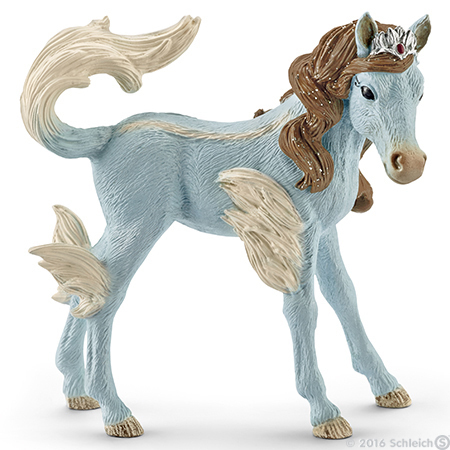 Eyela's King Foal Figurine from Bayala series. Made by Schleich in 2016. Brand new, never used or played with. Figurine comes in original Schleich packaging. Eyela's king foal lives in the princess's garden. Whenever Feya visits with her puppy, the two little animals dash around like crazy. Sometimes, it makes Eyela get really worried about her rare flowers. The foal is already big enough to accompany the princess on her rides. He can gallop incredibly fast. After a while, when he gets tired, he flops down somewhere in the grass and sleeps like a baby. Then Eyela waits until the foal wakes up and accompanies him home, her heart bursting with love. The most unusual thing about the little foal is the colour of his coat, which is a dazzling blue. "A beautiful royal blue," Eyela thinks. "And it goes wonderfully with my dress!" Sometimes, she dresses her rare foal up in a little crown. "It suits you brilliantly!" the elf princess enthuses.